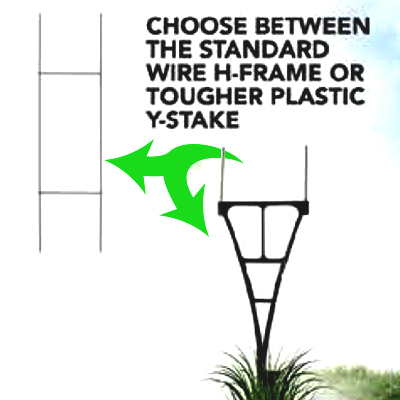 Sign Stakes Available As A Standard Wire H Stake or Tougher Y Plastic Stake. Wire H Stake - Total height 30" Total width 10"
Plastic Y Stake - Total height 26" Total width 12"
Available in increments of 1, 3, 5, 10, 15, 20, and 25. Sign Stakes: Have the yard signs but no stakes? You’re in luck—we’ve got 2 options to choose from. The traditional metal Wire H Stake stands 30” tall and 10” wide. The more durable Plastic Y Stake stands 26” tall and 12” wide. Our Sign Stakes are available in quantities of 1, 3, 5, 10, 15, 20, and 25.